Developed by the samurai and rich with ceremony, Kyudo, “The Way of the Bow,” is the elegant method of shooting the traditional Japanese longbow. 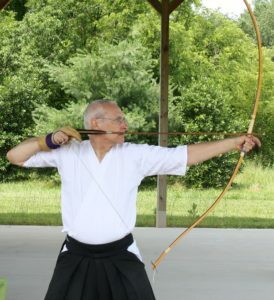 Participants will practice a variety of postures and movements, and learn how to draw the bow and shoot it with emphasis on technique. Bill Reid is the president and chief instructor of the Virginia Kyudo Renmei, which was founded in 2001. Bill holds the rank of 5th Dan and is a student of Dan DeProspero, Renshi, 6th Dan, of Apex, North Carolina. This class meets on the second Sunday of the month.